I had an entirely different post written and ready for today, and then life happened, and that post got placed on the back burner. The thing I learned today, and that I continue to learn over and over through my journey through this thing called infertility is that some things are just out of our control. There are some things that no matter how hard we try, how well we stick to the plan, how good we do, we still find that things are just not in our control. And that’s where I found myself today. And though we may not have control, I still believe we are not powerless. I am not powerless. And the reason I am not powerless is that even though another piece of the puzzle crumbled in my hands, I still have full control of how I move forward, how I respond, how I fight back. I can crumble and fall to the ground or I can choose to stand back up and keep walking forward. And so I will. Over the past four years of trying to have a baby, I have often found myself playing the ‘but I’m a good person’ card or ‘we deserve this’ or I have sat in pity and sulked over our situation. I have looked at teenagers who accidentally find themselves pregnant and think “why can’t that be me?” But again, even in the face of science, the control is not for me to have and thinking in these ways will do nothing to bring me a baby to hold, a baby of our own. The fact that I am still standing here 4 years later, walking, moving and ‘keepin’ on’ is what matters more than anything in this situation. The fact that Anthony has continued to catch me every time I fall is what matters. The fact that I have control over the way I live day to day even through the toughest of times, that is what matters. My mom had breast cancer. If anyone doesn’t deserve an ounce of bad to happen to them it’s her. And yet, throughout her pain and suffering, not once did she act powerless or lost and she never gave up. And that’s why she stands here 16 years later. She taught me that the only option is to get up, trudge through, and know that there is still hope in each and every step. Perhaps you are going through a really tough time as well in your life. Maybe you need to hear a good ‘chin up’ from someone to keep moving. Know that while you may not have control, you are never powerless. You have the power to choose, to fight and to keep on keepin’ on. And I hope you will do that with me. Sure, there are plenty of tears that may still come, and know that there isn’t anything wrong with that. Just know you are supported, know you are strong, and know you will make it. You will. On that note, amid all of this, Thanksgiving is just a week away. And so that’s something I need to put my focus on: family, food, friends and all the things that really matter. I saw cranberries at the grocery yesterday and realized I hadn’t made anything yet with them and it’s January. Also, I saw cranberry oat bars that I wanted to try to make so therefore I decided a cranberry chia jam was what I needed. 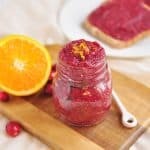 But not just any cranberry jam, I would need a combination of cranberry and orange–THAT’S what I wanted. And so that’s what I went with. And it was sooooo easy and so delicious. 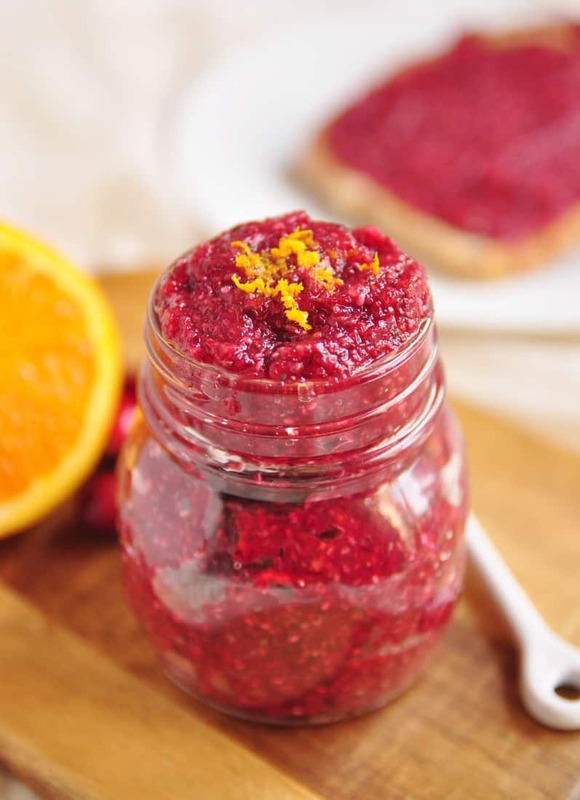 Chia seeds not only add protein and nutrients to the jam, they also thicken up the jam so the work is practically nothing. Who could ask for more?! 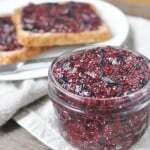 This is a great jam to use for toast, oat bars, in desserts or parfaits and only a handful of ingredients. Now that’s something to be thankful for! 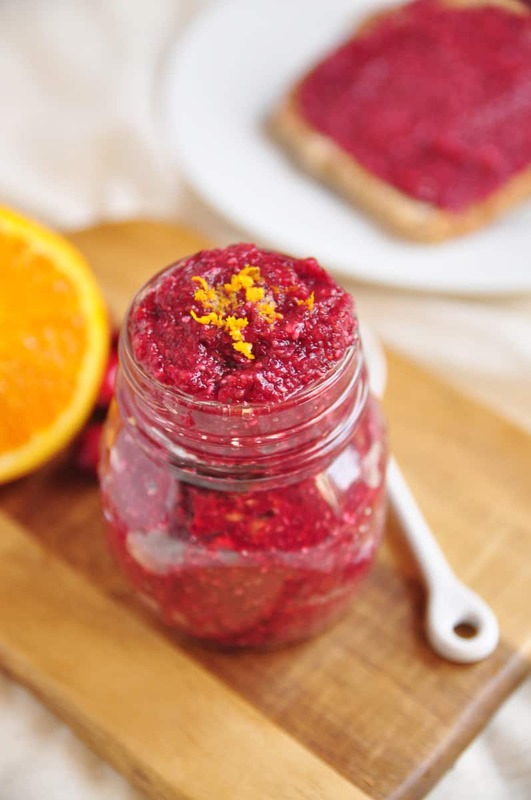 In a food processor, combine cranberries, maple and orange zest and juice. Process for several minutes, stopping to scrape the sides down, until a smooth texture, or to your desired texture. 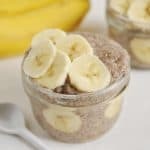 Move to a bowl and stir in chia seeds. Cover and chill for about 3-4 hours. This was a fantastic way to use up that last half bag of cranberries I had after Thanksgiving. It was delicious on some potato pancakes this weekend. As always, thank you! Glad you liked it Sarah and so good you found a use for the last of the cranberries. I’ve been trying to use up all my produce these days!